Lava flowe on Hawaii. 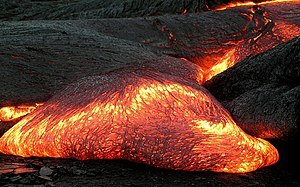 Lava is the extrusive equivalent o magma. Magma (frae Auncient Greek μάγμα (mágma) meanin "thick unguent") is a mixtur o mouten or semi-mouten rock, volatiles an solids that is foond aneath the surface o the Yird, an is expectit tae exeest on ither terrestrial planets an some naitural satellites. This page wis last eeditit on 16 Februar 2018, at 06:40.